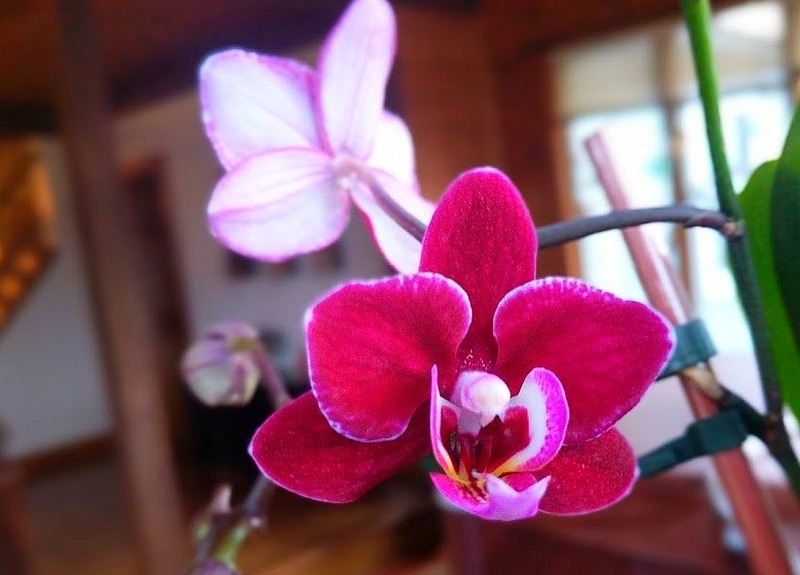 Having orchids indoors during the winter months is one of the things that keeps me from going crazy during this season. I’m not sure if there is anything better than checking out my orchids indoors while there is snow falling outside! This lovely little miniature orchid was an impulse by from a visit to Home Depot. I am a sucker for all of the things near the checkout line, so a display of small orchids for $6.99 wasn’t even worth fighting. Large or small, you can get an orchid bloom again. 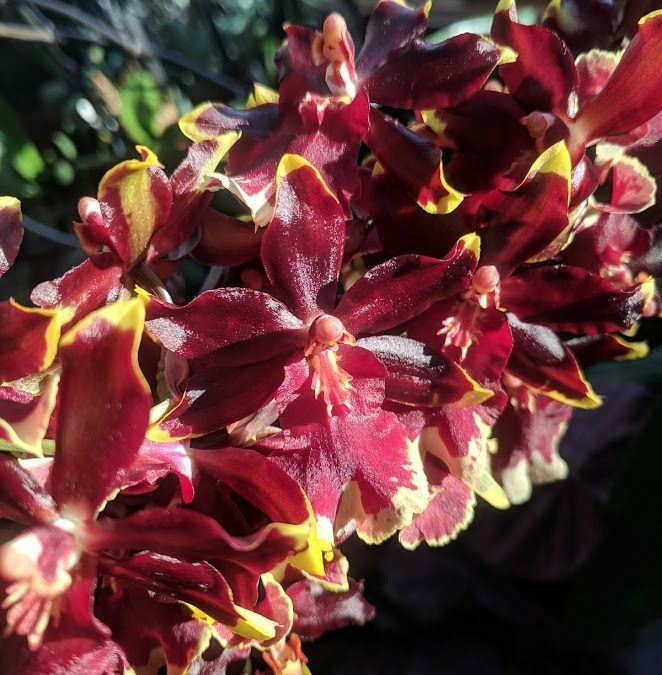 I find that most orchid flowers last 3-4 months in our house if they were purchased in good condition with a several of the balloon-like blooms yet to open. What a deal these orchids are compared to cut flowers! Along the stem of the orchid you can see small white lines that circle the green stem. These are called “nodes” and it is at this point the plant is able to produce new growth or where flowers were previously attached. It is worth noting that the stem must be green for your orchid to bloom again on this stem. If it is brown go ahead and cut it off at the base and wait for the next bloom stem in 6-9 months. The arrows on this image show where the nodes are at along this stem. 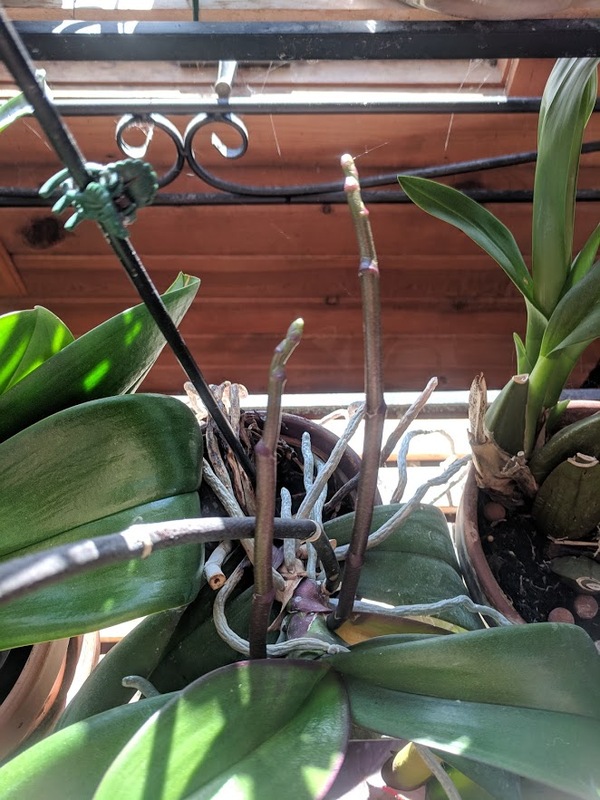 Some folks will recommend to cut the orchid bloom stalk in half to encourage new flowers but I don’t find that is necessary. Almost without fail, the new bloom stem will develop at the third node from the base of the plant. See the little nub on the image below? That is where a new stem is starting to grow and new orchid blooms will develop. It will take 4-6 weeks for this to mature and flower buds begin to form, but it is worth the wait. In my experience this secondary flower stem is usually smaller than the first, but always a joy to see. At this point just continue to maintain your orchid in the same manner as before. 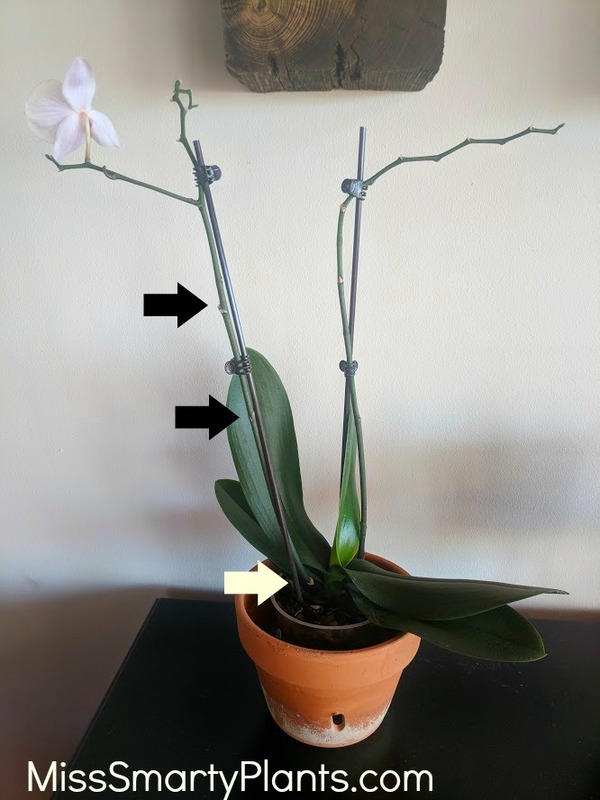 If there is already a stake on your old orchid bloom go ahead and leave that there to help support the new flowers that are forming. You can see how happy some orchids indoors will be to rebloom. 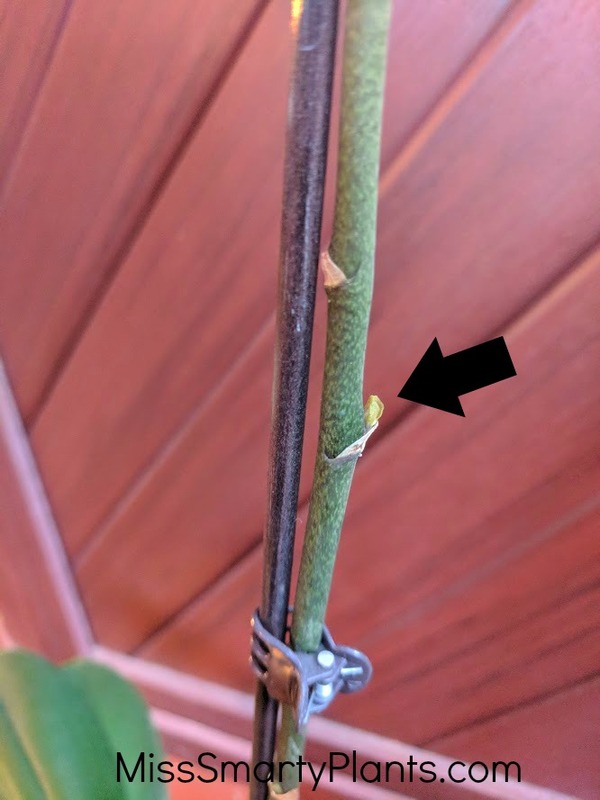 This flower spike has been without any flowers on it for about four months, but recently it started sending out new bloom spikes all along the old stem. 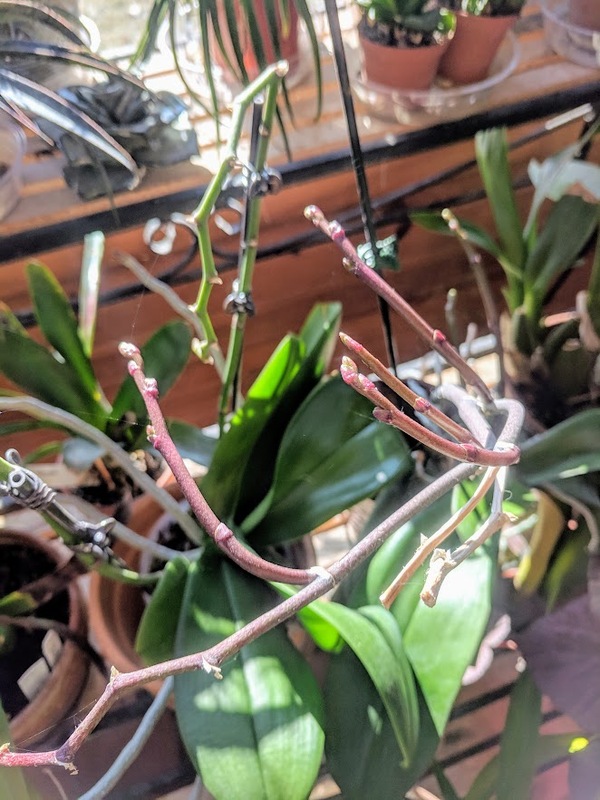 The other place to get orchids indoors to flower is on completely new flower spikes. You will see these starting to emerge from the base of the plant and they look distinctly different from leaves. My advice here is to be patient, these shoots will take some time to grow to the full size and begin to form the balloon-like blooms. 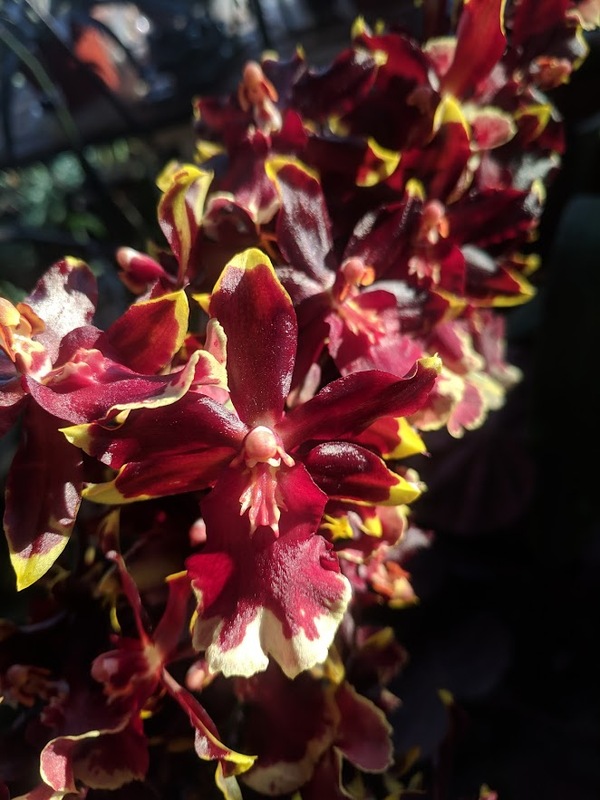 Winter is a wonderful time to appreciate growing orchids indoors. While mine spend the summer outside pretty much fending for themselves, this is a chance to enjoy the delightful colors and flowers.